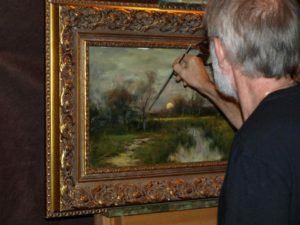 Master painter Dennis Sheehan of Manchester, New Hampshire is with us for the very first time to share his knowledge and skill in Tonalism. This workshop will introduce the student to the various ways of beginning illuminating tonalist landscape oil paintings with the use of transparent oil paints, as well as how to complete a painting through the use of chroma and neutralizing colors to create compelling finished pieces. The mornings will begin with a demonstration, and students will paint in the afternoons with his assistance. This workshop is offered to all levels.